It’s the world’s favorite wrinkle reducer—and recent NewBeauty award winner, along with our other injectables, Juvéderm Volbella® and Radiesse®! But there’s a lot more to Botox® than you might think. Here’s a look at the many applications for Botox, the world’s #1 non-surgical cosmetic treatment. By slowing your muscle movement, Botox helps to keep your skin in a relaxed, smooth-looking state, which prevents dynamic wrinkles from forming, which are wrinkles that result from years of repeated muscle movements, like laughing or frowning. 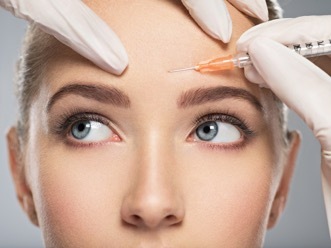 Thanks to Botox, the younger 20-something and 30-something set are becoming more pro-active about their skin care than ever before, using Botox and other skin care treatments to maintain their youthful look. Botox helps balance other areas of your face. In addition to smoothing lines and wrinkles on the forehead, between the brows, and crow’s feet around the eyes, Botox can be used off-label to rejuvenate other areas of the face, such as under-eye wrinkles or a gummy smile. This trusted injectable is FDA-approved to help slow sweat gland activity and reduce overactive sweat glands, called hyperhidrosis. People who suffer from frequent migraines may find relief from FDA-approved injections of Botox into targeted areas of the scalp to help curb this common chronic condition. Botox is FDA-approved to help urinary incontinence. Overactive bladders can be calmed with Botox injections, resulting in reduced symptoms of urinary incontinence. Though we don’t perform this type of Botox treatment, we can help refer you to a specialist. Botox is also FDA-approved to treat eye twitching, lazy eye, and cervical dystonia, a painful neck condition. We can refer you to an appropriate specialist, who will help you determine if Botox is the right treatment for your concerns. We are thrilled to provide award-winning Botox, in addition to Volbella (“Best Filler For Plumper Lips”) and Radiesse (“Best Filler For Hand Rejuvenation”). To discover the benefits of Botox and dermal fillers for you, please call 315.663.0112 or request your personal consultation today.